Here are a few tips and tricks to help you plan your trips. Know the details of your trip before checking the information tools and planning tools offered. From where am I leaving? What time do I have to leave at? What time do I have to arrive at my destination? Do I have to go to several places? A full range of tools are available to easily find information about schedules, itineraries and payment methods. Whether you are at home, the bus stop or a Service Point, you will always be well informed. View the description of the information tools and planning tools to identify the ones that are best suited to your needs. Plani-Bus is the best tool to create your personalized itinerary based on your needs. You can also contact Customer Relations at 819 770-3242. The information staff will be happy to help you figure out your itinerary. Once your trip is planned, you need to decide how to pay your fare based on your rider profile and how you use the service. Check the Fares section of our Web site to learn more about the fares available. Check the Taking the Bus page to learn more about using public transit on a daily basis. 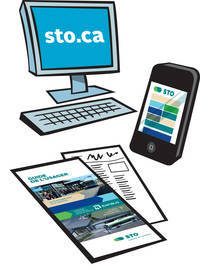 The STO has developed tools to make it easier to use public transit. Download them to learn more and print them if necessary (available in french only). Use the trip planning sheet (available in French only) to write down the information for your trip (departure and arrival, bus route to take, transfers, etc.). It is also a reminder of the trip details to and from your destination. Create a profile to receive the SUBITO PRESTO newsletter and keep up to date on promotions and exclusive contests!